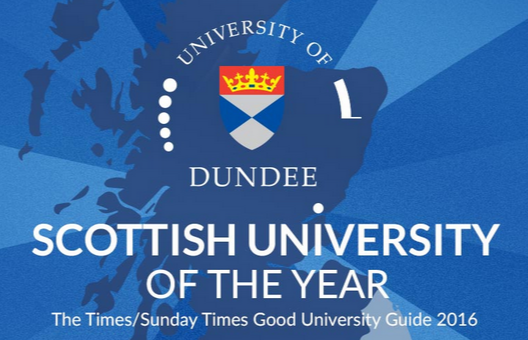 On Friday the University of Dundee was named Scottish University of the Year in the Times and Sunday Times Good University Guide 2016. This annual award was based on an in-depth review of higher education in Britain. "Our success follows a sharp rise in our overall ranking in the Good University Guide’s league table, we have risen eight places to 37th in the UK rankings and to fourth in Scotland. We are now the top university in Scotland under The Times and The Sunday Times analysis of the National Student Survey outcomes for teaching quality, ranking ninth-equal in the UK." 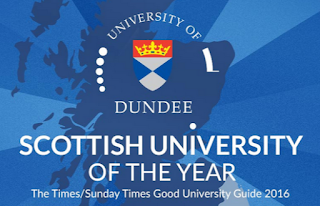 This is a significant and well deserved accolade for the University of Dundee and is another positive indicator of the renaissance of Dundee. Congratulations to the all the academic and support staff on their collective achievement.